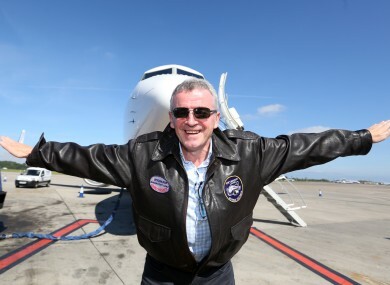 RYANAIR CEO MICHAEL O’Leary has admitted that the Irish airline will not be running low-cost long-haul flights for at least the next five years. The budget carrier is poised to implement the latest part of its growth strategy (or making itself look less mean to the layperson) by working with long-haul carriers to provide connecting flights to London’s Stansted airport. The admission came at a news conference in London to announce the prospective partnership with Stansted. The latest move is a logical one from both sides – Stansted is Britain’s fourth busiest airport and a major short-haul carrier hub but has no access to long-haul carriers at present, while for Ryanair it will be a case of increasing their load numbers without incurring extra costs. Speaking to TheJournal.ie Stephen Furlong, transport analyst for Davy Stockbrokers, suggested that Ryanair is unlikely ever to go long haul. “Ryanair themselves won’t do it, regardless of what is hinted at. They’re such a huge player in the Euro market and they have no widebodied aircraft so it simply won’t happen,” he said. But you can see a scenario where network long-haulers play in with them. Stansted wants long-haul flights no question, and Ryanair now has an American website which they could use to market these connections to the US, it’s a strategy that has been well worked out. Davy continue to rate Ryanair, along with would-be Aer Lingus takeover merchants IAG, as their marquee picks in the European airline market for the foreseeable future. For now, the low-cost airline’s ‘transformation strategy’ is yielding dramatic results – profit guidance for O’Leary’s company has been raised four times already for financial year 2015. “If you go forward in Europe in the next five or 10 years, I think the low-cost carriers, mostly ourselves and EasyJet will do a lot more feeding of major airlines,” O’Leary told the news conference. There may be issues of course, I wouldn’t want Ryanair flights delayed because another connecting long-haul flight is late for instance. But we are not as black and white as we used to be, we’re less dogmatic and I’m learning that we won’t rule anything out. Email “Fly to Australia for €200? Not with Ryanair you won't”. Feedback on “Fly to Australia for €200? Not with Ryanair you won't”.